Bring color and style to your backyard birding sanctuary with the Anthony Stoneware Two-Piece Cone Bird House. 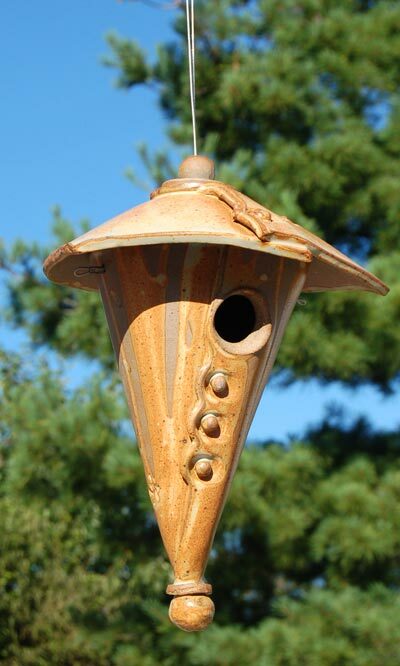 This house is ideal for small songbirds and features a 1.25" diameter opening. The cap slides up the included plastic coated steel wire hanger to make seasonal cleanouts quick and convenient. Each piece is handcrafted on the potter's wheel or constructed from clay slabs, then fired to 2400° F to create a very durable vitreous product that will not decay, fade, or breakdown in UV light. With care, this Bird House will surely become an integral part of your garden, season after season. This house may be hung using the included 15" steel wire hanger. Made in the USA.